Stretching between the Madison River and the Lee Metcalf Wilderness Area, the Sun Ranch contains some of the most valuable wildlife habitat in the entire Greater Yellowstone region. It provides critical big-game winter range for elk, mule deer, moose, pronghorn antelope, bighorn sheep, and mountain goats. Grizzly and black bear routinely use the property, as do wolverine, Canada lynx, pine marten, beaver, bobcat, river otter, and mountain lion. In addition to several miles of Madison River frontage, the ranch includes long stretches of four important mountain-fed creeks, which provide critical brood-rearing habitat for various species of fish. This abundant and diverse wildlife thrives as part the everyday life of the ranch, which is managed using sustainable techniques that ensure the working heritage of the property will also be honored and preserved. In 2008 TPL purchased a conservation easement on 11,000 acres of the ranch, adding to 6,830 acres protected with the help of The Nature Conservancy in 2002. 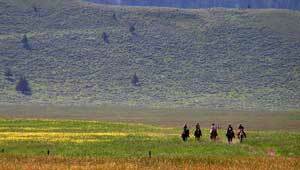 Now, 95 percent of the 19,000-acre ranch is permanently conserved and protected from development preserving a beautiful landscape and the rural character of the Madison Valley.